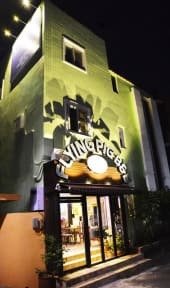 Flying Pig was established as a guesthouse in 2012. Our business is still in its youth but second to none in this market. In 2013, we started Flying Pig Travel Agency and we have just opened Flying Pig Bed & Breakfast in 2014. As our qualified reputations, guests can meet cozy accommodations, easy access to most touristic places and valuable packages. Flying Pig Bed & Breakfast is located near 2012 Yeosu EXPO Site, just 3 minutes from Yeosu EXPO main gate. Most of touristic places are easily accessible for travelers in our B&B, such as Odong-island, Dolsan Bridge, Ferry terminals, Fish market and local shops. Flying Pig Bed & Breakfast offers fine English breakfast to start your day. In the evening, we have complimentary tea time in the lobby with our guests, who are staying on the date. Also we have a little garden can have barbecue by yourselves. (1) Check-in later than 23:00 must be informed before the day of your arrival, otherwise your reservation will be cancelled for the other guests in the queue. (2) For key deposit, we request KRW5,000/person of refundable fee. Deposit will be return when you check-out if there is not lost key or damage locker. 3. We cannot accept early check-in or late check-out request. 4. Payment: Cash or credit card is welcomed upon arrival. (1) Cancellation must be made by 22:00 (Korean time) of one day before arriving. (2) If cancelled later or in case of No-Show, the full balance will be charged and not refundable. 6. Age Restriction: Under age of 19 need to submit parent’s consent. 7. Reception Hours: from 08:00 to 23:00. 8. We offer only bed and linen to keep lowering prices, please bring your own amenities such as a towel, soap and tooth paste, for your own convenience. 9. 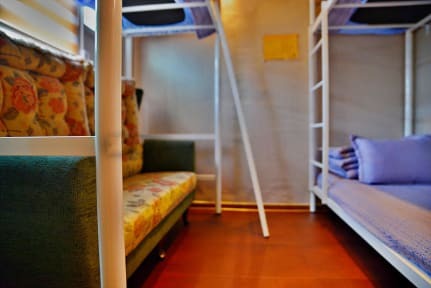 The hostel is smoke-free building (No exception at Flying garden). 10. Eating or drinking is acceptable just at Flying court (lobby) and Flying garden. 11. Flying court (lobby) and Flying garden open from 14:00 to 23:00.